Picking up from the end of the previous episode here the gang all descend on Buffy’s house for a night of post battle movie watching while Riley heads off for a debriefing on why the government is now having to close down it billion dollar secret project, much less the part him and his new friends played in it, with the outcome expected to be that he will be given an honourable discharge due to the amount of witnesses and the general desire of the government to sweep the whole mess under the carpet. 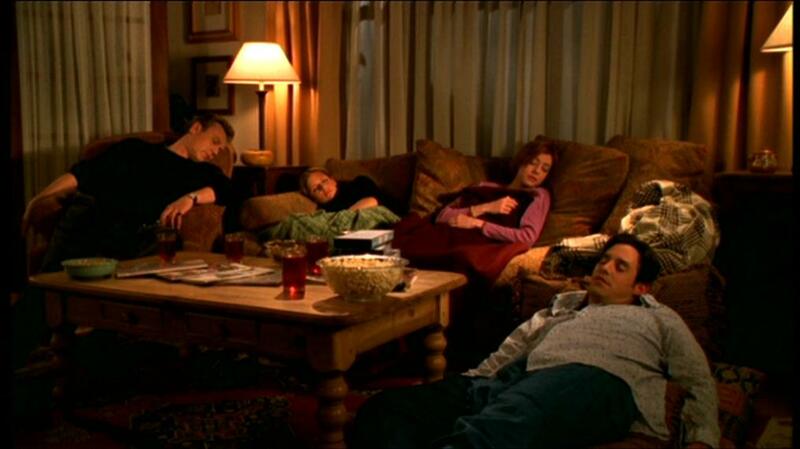 Buffy and the other Scoobies meanwhile are mere moments into the FBI warning when they all fall asleep where they soon find themselves being hunted in their dreams by a mysterious force. Arguably a better episode than the episode which really should have been the finale, its hard to question its position as the season 4 closer, while at the same time its still unclear why they choose to do this. Was it that they doubted the fans would remember where they left the characters or was it that they felt this one was just too weird to open season 5 with? Whatever the reason this is as I mentioned already certainly one of the stranger episode not only of this season but the series as a whole as it mainly takes place in the individual dreams worlds of Buffy, Willow, Xander and Giles making me wonder if David Lynch has secretly directed this one, especially when we have a man welding a plate of cheese slices and Buffy’s mom randomly showing up in the walls of Sunnydale High. The downside though to this encounter being that its never explained where Buffy gets all this background knowledge about her predecessor from much less how she know the source of her power lies in Buffy believing she can be hurt by her. The individual dreams sequences are all fun in their own ways with Xander being the best as he decends into his own “Apocalypse Now” style fantasy which includes Principal Snyder showing up as Colonel Kurtz. Principal Snyder’s surprise returning being just one of the numerous cameo apperences scattered throughout the episode including Harmony, Adam and Oz though the original plan had been to include a greater number of characters returning in these dream scenes including Cordelia, Amy, Angel, Faith and Jenny Calender however due to scheduling issues this never happened with Jenny being replaced by Giles girlfriend Olivia and sadly leaving the Buffy fans with a sad feeling of what could have been. While this episode unquestionably for most of its runtime leaves you in a state of confusion its also an episode which has enough confidence in the writing for the audience to stick with it to the end, while the use of the first Slayer was a great bonus, especially from the perspective of getting to draw comparisons between the first Slayer and Buffy the current Slayer. Still in a season of misfires though this was a great note to end the season on.